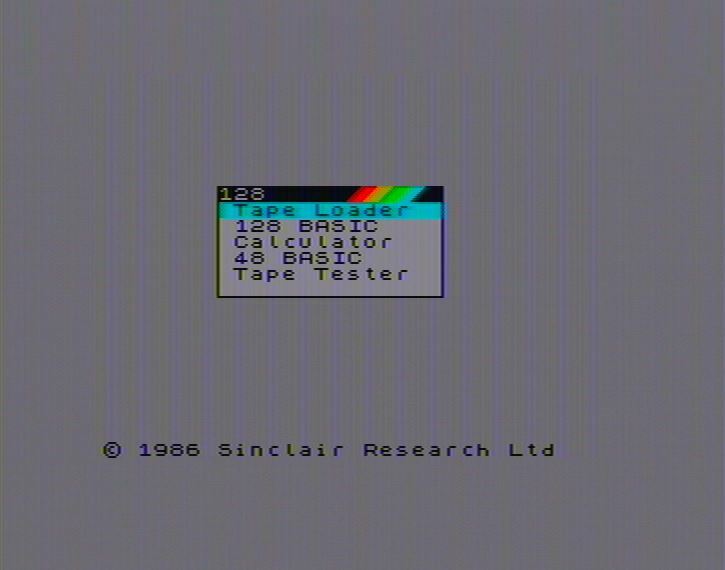 When using the RF or composite output from the 128 Toastrack or the Spectrum +2 (and indeed the RF output from later +2 and +3 models), you will no doubt observe blue and yellow ghosting effects that are quite apparent around text and on the menu screen. It’s easy to install a small modification to remove this ghosting and improve the quality of the picture output via RF or composite. If you exclusively use RGB though, you won’t need this fix. Otherwise, read on. LC filter comprising of a 15uH inductor and 82pF capacitor, installed between pins 8 and 17 of the TEA2000. Remove the PCB from the case and turn it solder side up. 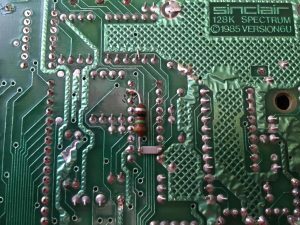 Locate the TEA2000 IC, just a little bit south east of the RF modulator on all 128 models when looking at the top side of the board. 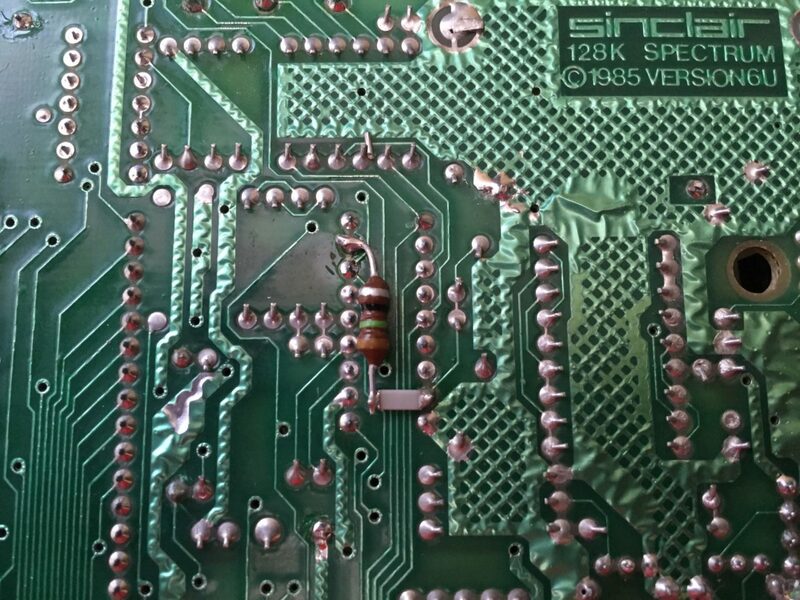 Being careful to select the correct pins, connect the inductor and capacitor in series between pin 8 and pin 17 of the TEA2000 chip. Ensure no other pins are contacted. In my case I’ve used a large-ish SMD capacitor to make the mod a little bit neater. Below I’ve included screenshots of the effect this modification has on a standard Issue 6U 128K Spectrum. Similar results can be achieved on all other +2 or +3 models. On the Spectrum schematic, the following components can be seen connected to pin 10 of the TEA2000. This is described by the TEA2000 datasheet as an optional chrominance filter, but doesn’t mention why it might be necessary. It does mention however that if this is used, then a delay line component should be added to the luminance signal. 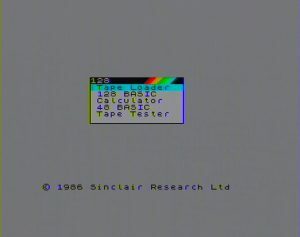 This is not present on the Sinclair or Amstrad Spectrums but is present on the Sinclair PC200’s composite video board. Inductor L2 as shown is adjustable to a certain degree and can influence the severity of the ghosting, but cannot eliminate it. Another contributary factor to the ghosting effect is HF noise on the luminance signal before it enters the TEA2000 to be mixed with the chrominance signal. Noise in the 4.43MHz portion of the luminance signal is undesired as it will interfere with the quality of the chrominance signal added within the IC. To solve both these problems, a simple LC filter is added as described above between pins 8 (LUMI) and pin 17 (GND). This removes most of the interference from the luminance signal and has the effect of significantly improving the quality of the picture by removing most of the ghosting effect.